Cloud hosted communications technology has increased dramatically over the past five years. More and more organizations are upgrading their communications technology to take advantage of fiber internet speeds, hosted PBX technology, and direct connections to the cloud and data centers. One of the most exciting developments has been the emergence of single-source providers, making communications a much easier beast to handle. This is called Unified Communications as a Service, and you can read how we provided Montogmery College with a connected campus to see how UCaaS applies to the education sector. But when talking about voice specifically, we get a lot of inquiries about Hosted PBX. Moving from a legacy system to a cloud-based platform allows a growing business to access enterprise-level functionality with lowered infrastructure costs and reduced administration. When the benefits are outlined, the decision becomes a no-brainer. Faster innovation requires cutting-edge technology. A move to the cloud brings the capabilities a growing company requires. Businesses experiencing rapid growth and high expectations can't afford downtime or the distraction of time-consuming infrastructure changes, both of which are avoided in a move to a hosted solution. Rapid deployment is a key factor when considering a move to the cloud. Physical Security: Making the move to cloud-based services means that critical hardware is no longer exposed to local threats, internal misuse, and potential environmental risks. Direct Connectivity: Beyond physical security, direct connections provide the ultimate level of security compared to commodity internet. Expert Service: Expert service and monitoring 24/7 lowers reliance on distracted or less expert internal resources. Fewer network outages and outsourced security maintenance are to be expected on the cloud. Increasing bandwidth, adding additional offices, changing locations, and implementing mobile solutions can be handled on the fly when business communications are in the cloud, making scalability that much easier. Growth can bring uncertainty. Where will your business be in 6 months? Who and what will need to be integrated into your communications network? Your most valuable partners and clients can be thousands of miles away but they need to communicate as though they're next door. Mobile workers, personnel deployed at trade shows or on customer sites out of region, and outside sales require mobile connections, all of which are available in the cloud. Latency and jitter are delays that occur when data travels over the internet and data packet delivery is disrupted. They're caused by poor connections, dropped calls, and poor video quality. When a business moves to the cloud and chooses private, direct connectivity, data packets can be prioritized and delivered more reliably. Choosing a partner that offers direct connectivity, access to major cloud service providers and SIP trunking will ensure high-level quality. Business continuity planning and management allow a business to remain operational in times of serious incident and disaster. These unforeseen and unexpected disasters are those that keep IT professionals up at night. A growing business cannot afford the lost productivity, lost sales, and damage to reputation of a major outage. With unified communications, your business continuity plan is smart and instantaneous. In the event of an outage, all operations can shift automatically within the cloud, which offers better immediate access to applications, data, and the communications network. With hosted communications, the cost of hardware, infrastructure, and resource management is reduced. Shift resources to projects that drive growth instead of spending money to maintain an obsolete infrastructure. Fewer headaches and downtime and less stress mean small business operators can focus on running their businesses instead of PBX communications. Jitter, latency, and dropped calls are that can be mitigated when using a direction connection to your voice carrier. Advanced functionality allows for easy mobility. Call centers function at top efficiency and internet downtime is minimized. Overall user experience is maximized. When you partner with a full-service provider, all your services are streamlined. There is one bill for all connectivity services that simplifies accounts payable. Customer service is unified. One call to an experienced contact that can offer troubleshooting and support 24/7. No more confusing 1-800 numbers to dial in the middle of the night or on the road. In the cloud, expect customer service that reduces stress and increases productivity across multiple business units. Would you buy a legacy Nortel or Avaya phone system? That's like saying you'd buy a Motorola flip phone rather than a iOS or Droid smartphone. The growth of cloud-based phone systems have consumed the marketplace and legacy key and premise-based PBX systems are all scrambling to cry "me too" with cloud editions. 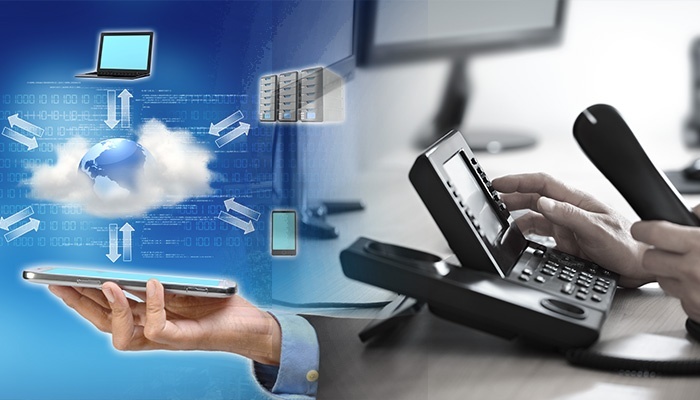 A cloud based phone system replaces traditional land lines and offers hosted communication using the Internet rather than traditional analog or PRI lines. Moving to hosted communications offers the following benefits for small business. 1. How Many Phones Do You Need? Are there common areas that require phones? How many desk workers in each location? How many conference room phones? How many console type phones for receptionists? How many remote workers do you have? How many mobile workers do you have? 2. Do you need to integrate with Outlook or a CRM system? Review what platforms your business relies on and how they need to be included. 3. Do you have any analog devices that you need to integrate with? 4. Do you need mobile backup? If there is an outage, are calls forwarded and where do they go? The ability to access wireless back up in the event there is a disaster recovery situation is a benefit of hosted communications. 5. What phone system features do you need? Hosted PBX – The move from traditional phones to a hosted solution isn’t a one for one swap. The additional functionality and flexibility of hosted PBX will transform your business communications allowing customers and staff to communicate seamlessly and support your business no matter where and how you work. SIP Trunking – SIP trunking delivers telephone service without incurring the typical metered calling charges of their existing analog and PRI infrastructure. It also enables a business to consolidate their number of lines to what they need rather than what a legacy telephone company can support. Instant Messaging and Presence – Hosted phone service takes communication capabilities beyond a simple phone call. Instant messaging and “presence” status updates display location and status information dynamically. Desktop and File Sharing – A popular feature of cloud based phone systems is a file sharing application that facilitates the collaboration on critical documents from any location. Video Collaboration – In a mobile world, face to face communication is still unmatched. Reduce on-site meeting, travel and expense by including video collaboration functionality that brings remote staff and customers together with one simple click. Virtual Meeting Rooms – Imagine a virtual room where desktop sharing, chat and group meeting capabilities are provided without the need for external tools, systems, codes and other expensive, external and time consuming means. Intuitive Administrative Platform– Manage the entire system on an intuitive client that allows your small business and your employees to be flexible, mobile and productive. Access features and functionality, collaborate and communicate within one easy to use platform. 6. What kind of connectivity do you have? Get an understanding of your current connectivity solution and learn if it is appropriate for handling the move to the cloud. If you don't have Wireless backup, consider incorporating that into your network design as it is an important aspect of survivability for a hosted solution. Research the options to ensure your connectivity can support the needs cataloged above. Given the benefits of unified communications, a move to VoIP or cloud-based systems is a practical solution for small business. However, unified communications operate optimally only when smooth consistent connectivity is provided. When choosing a VoIP provider, it’s worth looking into the options. Many providers offer a “Bring Your Own Bandwidth” solution, meaning your connection exists in a shared network across the open internet. In a “BYOB” infrastructure, voice packets have to travel across the internet, exposing them to the possibility of dropped or lost packets. Only in a direct connection are those packets prioritized and sent directly to your phone system. What Makes the "Best" Hosted PBX Provider? By now, you know the benefits of hosted PBX, and some considerations to think about before upgrading. But, the question still remains, how do you find the right provider? We could spend time recommending local over nationwide, or vice versa - the truth is, there are strengths and weaknesses to every provider out there. So, we can't make recommendations, and if we did, we would obviously recommend ourselves. Technology is changing every day, and at a very fast pace. Just think about it, Netflix just isn't on every desktop today, but every phone. Video is becoming more a way of life and communication than a form of entertainment. The bandwidth that has managed your VoIP phone for the last five years is great, but when you decide you want to innovate or incorporate some of the emerging technology, your brandwidth will hold you back - or cause you to crash. Now, just think of getting something good enough for today, but having to go through the pain of an upgrade in five years because technology is leaving you behind. Trust me, your competitors are looking for an edge in the marketplace - and that edge comes through two areas: technology and service. If service is horrible, business suffers. But even the greatest service can't substitute for horrible technology. Can they provide cutting edge communications services right now? Do they have a plan for advancing into the future? Do they provide a full range of communications (UCaaS) and not just hosted PBX? Do they sell at a discount to get new service while camoflauging their aging network? Can they give you a direct connection to your hosted PBX servers? Do they provide their own network, or do they require you to bring your own connection (or do they rent their network from other providers)? 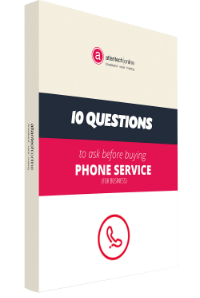 A positive answer to every one of those questions may not be a do-or-die for your enterprise. But, if you can find a provider that is leading in most of them, you probably have a winner. The Best Hosted PBX Provider in the Washington D.C. Area? Atlantech Online is one of the oldest surviving (and thriving!) Internet Service Providers in the Washington DC metro area. Founded in 1995, we take great pride in being a cutting-edge, full-service business telecommunications provider with a focus on Main Street, not Wall Street. As the telecom industry has changed through the dot com era and into the current time, we've managed to grow and adapt along the way. Although we are smaller than national companies with similar product lines, our size has been an advantage to our customers, and we continue to thrive knowing that we are the masters of business Internet connectivity, data center, and VoIP (voice-over-internet-protocol) phone service in the Washington, DC area. If you make the IT decisions for your business, school or school system, non-profit or government agency in the DC Metro area and you're in need of telecom services, you have to get a quote from Atlantech Online. Otherwise, you are simply not considering one of the best telecommunications companies in the region. With so much competition vying for your business, it is an exciting time to be in the market for business telecommunications solutions. Products have improved over time, and they have become more affordable as well. We remember when T-1s sold for thousands of dollars per month. Now, you can get 1000 Mbps circuits over dedicated fiber at half that price! One thing remains constant through these 20 years of radical change: Business has high demands and the need for service is insatiable. On our end, we’re confident the businesses that need us most will recognize the difference – we know the terrain better, offer better product value and build stronger relationships with our customers than the national providers do. This, despite – or perhaps because of – their sprawling infrastructure and greater buying power. The national providers just can’t compete with our superior tech, personal touch, and local expertise. While their focus is on growing their client base nationwide as quickly as possible, Atlantech's is on providing the best phone and Internet service for your business needs here in the DC metro region. One of the greatest advantages of choosing a local company is that we are here to serve YOU – not thousands and thousands of businesses all over the country. We walk the same streets as you do, and we share your mindset. We won’t outsource our support to an offshore call center, and when you need our services on-premises, our technicians can arrive in a jiffy. We have intentionally and carefully built our team to respond quickly and personally to our clients and their needs – yes, that’s you and whatever your company/organization requires from us. Practically speaking, it means we’re happy to meet you face-to-face, we support your phone and Internet service in a hands-on way, and we have seasoned representatives whose job it is to get to know you and the specifics of your operation. 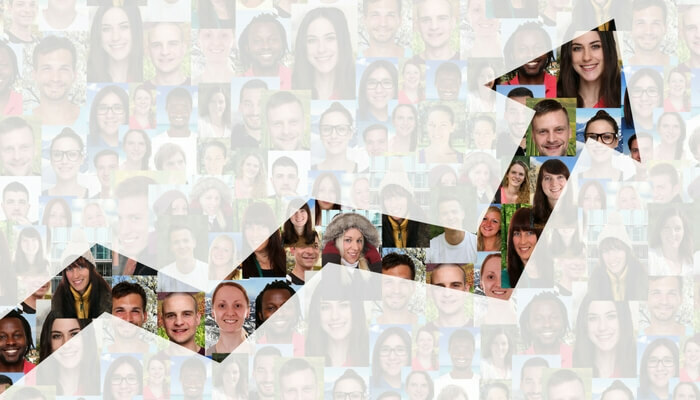 By dedicating account reps to our customers, we build lasting relationships that support a level of personal attention you can’t get at the national level. In addition to that, most personnel has been on staff for many years. You'll be confident that the people you interact with know who you are and are familiar with your wants, needs, and desires when it comes to telecom services. Too often, service providers sign you up and then make themselves scarce. We don’t. Too often, service providers are only interested in signing you up for the next big (costly) thing. We’re not. Sometimes, we've even said "no" to a customer desiring new service. Our familiarity with them may result in knowing that the LAN isn't ready to handle VoIP yet and that improvements must be made there first prior to truly being able to capitalize on a new service. We are here for you and work with you to find the solutions that deliver the most value for your company’s needs – not down the road for some future endeavor, but now. We come to you with powerful familiarity with the local terrain and mastery of the regulations that may pertain to your business. And that’s before we even begin doing our homework for your specific needs. Thanks to our ability to move quickly and make adjustments to our infrastructure as called for by our clients’ needs, our networks will never even approach capacity ceilings. While the big providers have been known to subject their customers to threadbare coverage that can come with trying to please too many people all of the time, we are too invested in network upkeep to provide anything less than robust, non-stop bandwidth. Similarly, we are able to make sure that we’ll never overload our networks. Instead, we make sure we are current with cutting-edge technology, so as to serve our customers with the best value in the region. We hold ourselves to the very highest of standards – not only for customer service but also for the best that technology has to offer – and we make sure to pass that excellence on to you. Some national companies get into disagreements about peering their networks and will cut each other off from each other. The result of this power play is that customer network performance suffers. But what do they care as long as Wall Street cheers them on for the win? Also, some of the national companies will try to protect other interests that their business has, and they'll throttle bandwidth or purposefully deteriorate a service to make their own offering more attractive. Atlantech Online knows better than this. Customers want unfettered connectivity. We know from experience that any mitigation of that will result in dissatisfied customers. The short term win just isn't worth it. We encourage you to take a quick look at our line of services offered. Sure, the values and standards discussed above apply to the Internet and phone services that we provide, but they also are evident in our colocation server options and cloud computing solutions. You’ll never feel like you’re receiving inferior service with us if you opt for some types of connectivity rather than others. Rather, we provide the same experience of excellent care, no matter what services you choose. We’ll be the first to admit it – there are situations where larger, national service providers are the way to go. If that is the case for your company, we’ll recommend you choose that path. Many companies have operations in multiple parts of the country, or even globally. While we still think we provide the best service in the Washington, DC metro area, if your company needs a single provider to service multiple geographic locations, Atlantech may not be able to provide that service. But even if our own network can't meet your needs, we can be the trusted counsel, or manage the relationship with other carriers to put together the network solution that best meets your needs. As opposed to agents, we won't have a financial interest in recommending one carrier over another. We want you to find the best service provider for your business, and even if we’re not the right ones for you, we will be happy to point you in a direction where you’re likely to enjoy better value. We believe that the combination of true technical expertise with impeccable customer service is unsurpassable – that’s why we work so hard to make sure we provide both. Ultimately, you’re the only one who can make a decision on what’s best for your company. If you’d like, we’d be happy to discuss our services with you, to help you make a choice. Get all the information you need to make the smartest decision for your business’ phone service.